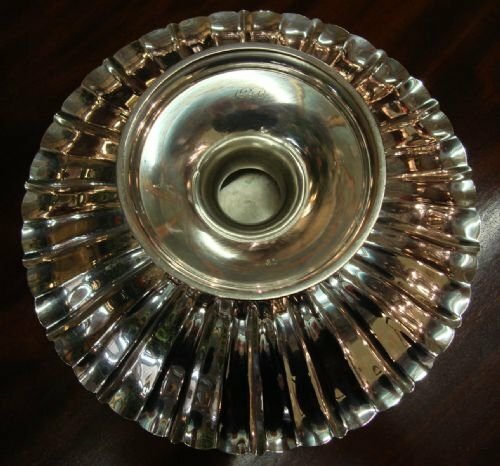 Circa 1905 solid silver large rimmed bowl made by the famous S. Kirk & Son Company of the USA. 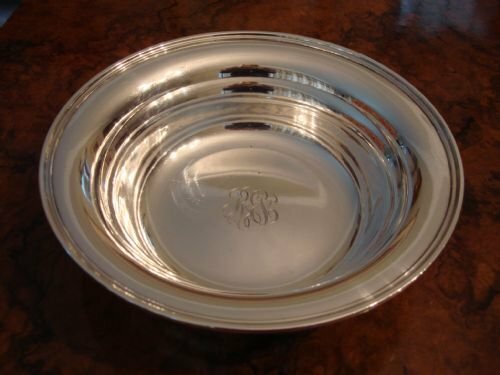 Circa 1905 impressive large American sterling silver bowl made by the famous S. Kirk & Son Company of Baltimore, Maryland in the USA. The company was founded by Samuel Kirk in the early part of the 19th century. 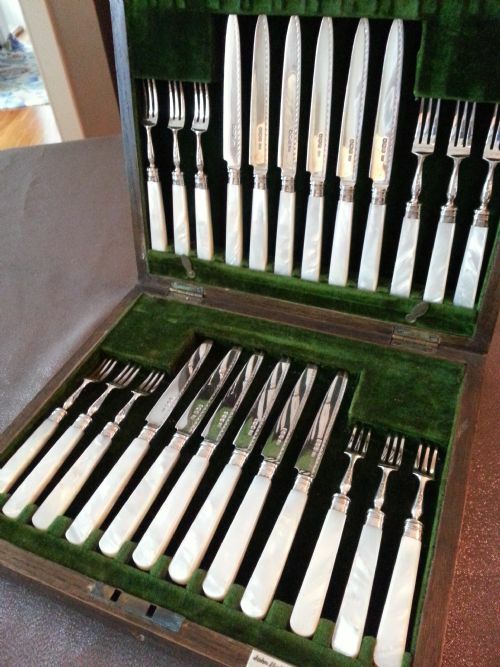 He was descended from English silversmiths, and his own descendants continued the tradition. 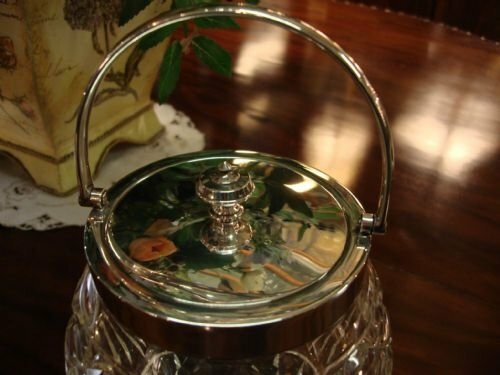 Kirk and Son was known for its fine craftsmanship, and its silver graced the table of White House administrations. The company was combined with the Stieff company, another Baltimore family firm, in 1979, and continues to this day. This bowl has a tapering edge rim with a thick moulded edge. 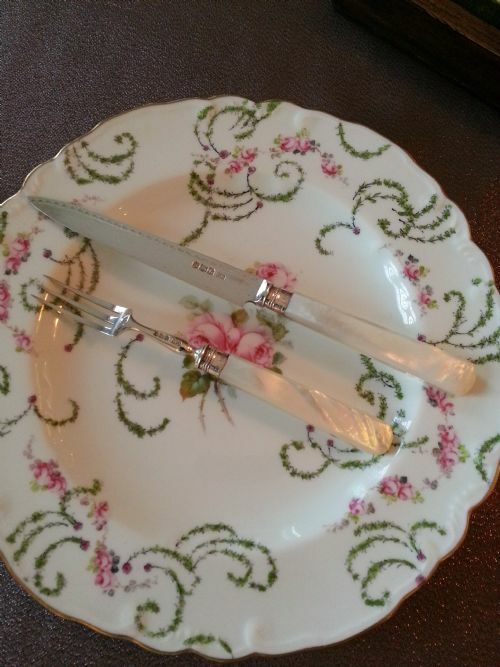 The sides continue to taper to the flat bottom, having an attractive monogram to centre. 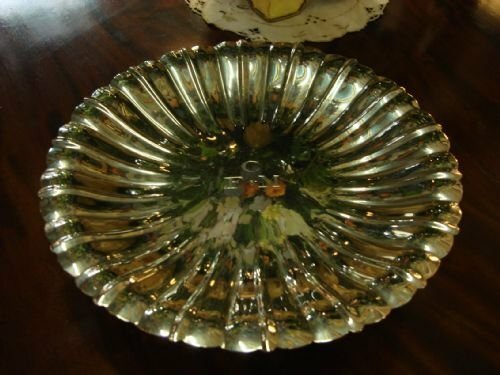 This bowl or dish can be used to serve fruit, bread, or whatever you wish. It is marked S. Kirk and Son Co. 925/1000. 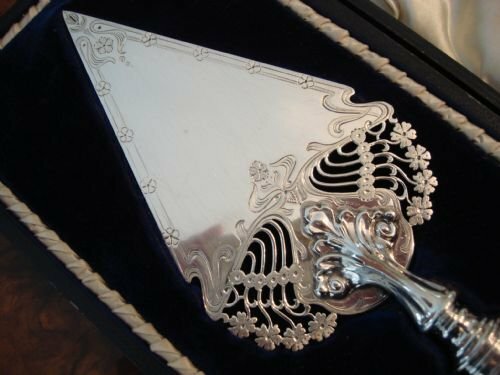 This is exactly the same fineness as English sterling silver. This impressive bowl, with good gauge, weight, and clean and classic style, is in very good condition having been professionally polished. 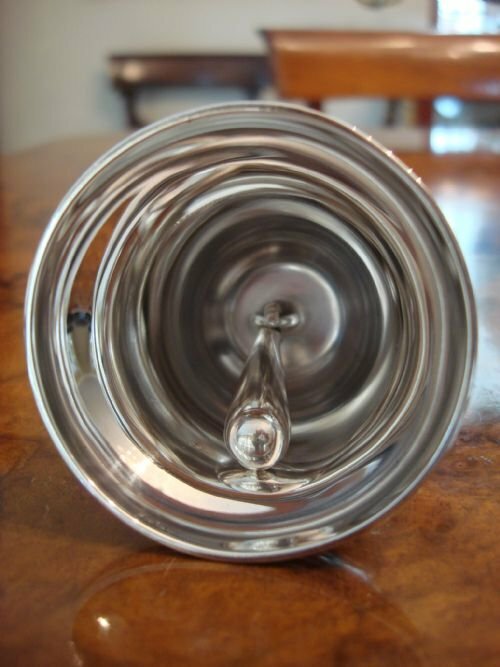 Considering the value of just the scrap weight of this bowl, this is a wonderful value, as silver prices continue to soar. It will look lovely on the table, or make a great gift. 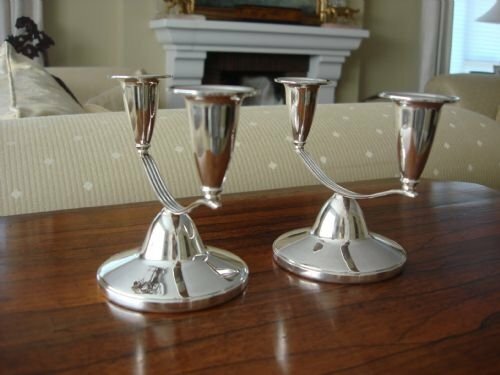 Wonderful Birmingham 1966 solid silver English hallmarked pair of candelabra by famous makers ELKINGTON AND COMPANY. 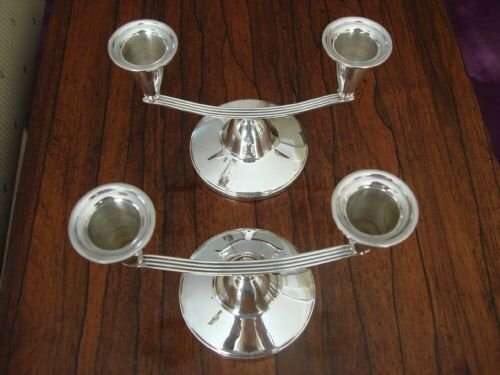 Birmingham 1966 English hallmarked solid silver pair of candelabra or candlesticks by world famous makers Elkington and Company, with twin branches joined by a curved and fluted member, bell pot candle holders, and standing on a circular footed base. Size- 6 inches wide by 4.5 inches high by 3.25 inches base diameter. 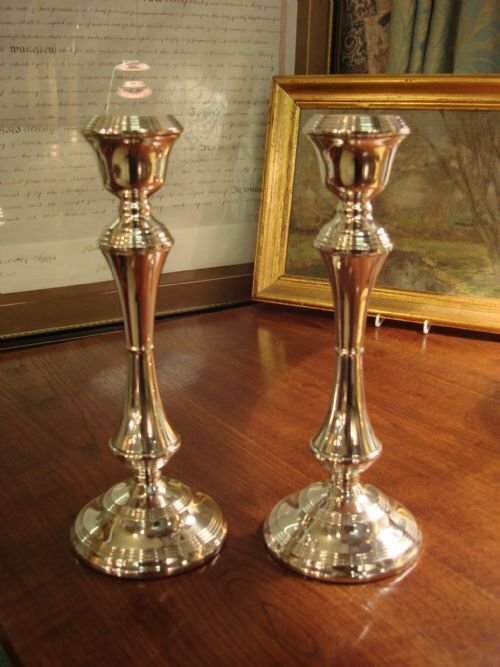 This is a very classic, simple and elegant pair, standing on loaded baize covered bases. With only one small line mark to one base, they are beautifully made and in very good condition. These will look lovely on any table, blend with with any silver pattern, and would make an excellent gift, or a treat to keep for yourself. The lower height is perfect to keep views unobstructed across the table. 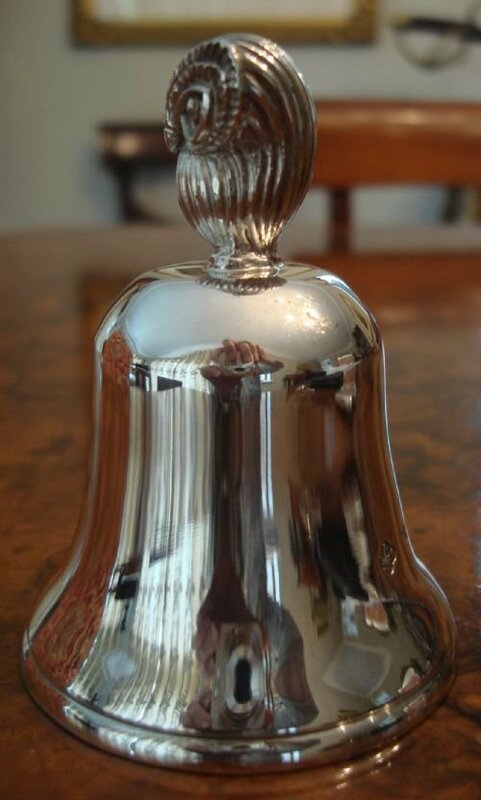 Superb and very heavy ASPREY English hallmarked cast solid silver table bell with owl handle by this renowned maker! 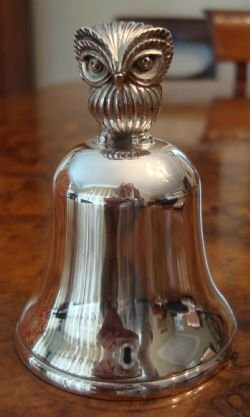 Stunning and beautifully made heavy cast solid silver table or dinner bell with well modelled naturalistic solid owl handle by very famous makers Asprey and Company of London, makers of the most exclusive luxury British goods since 1781. Their goods are made with exacting craftsmanship. Owls are always popular design features, particularly crafted in silver. Owls symbolise wisdom, as well as wealth and status. 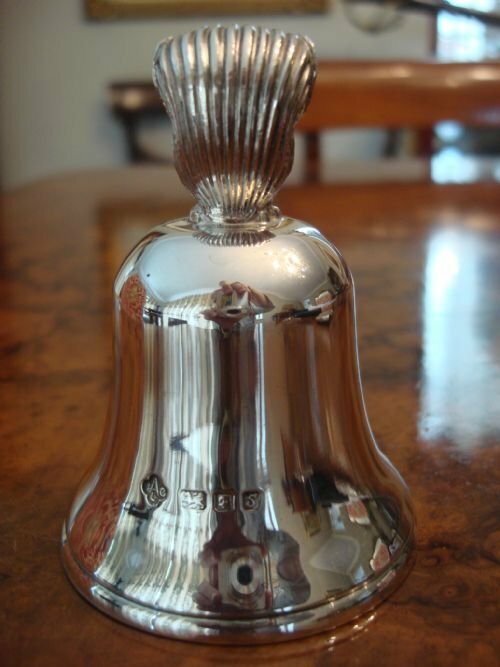 The bell is hallmarked for London 1973, and the solid silver clapper is also properly hallmarked. 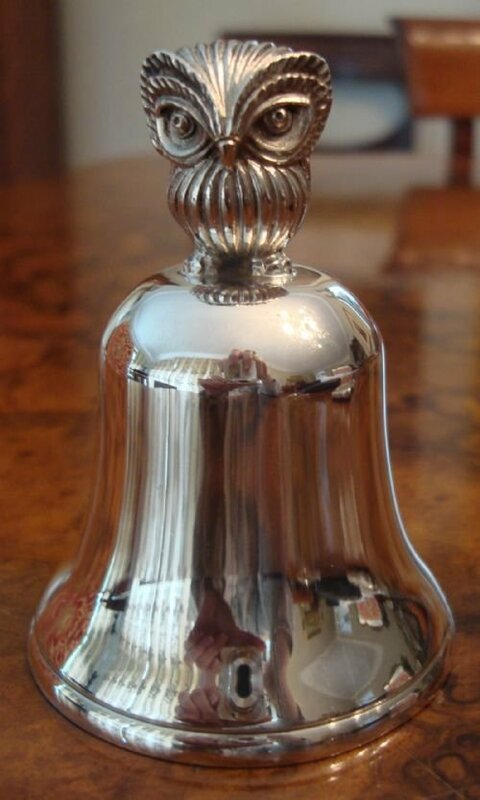 This unusual and lovely bell has a lovely sound, is very heavy in weight, and unusual in its design. 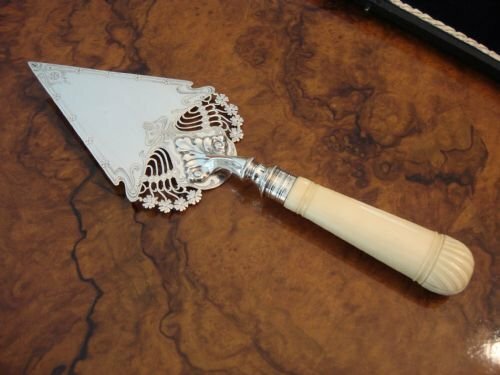 It would make an excellent addition to the dining table for fine dining when entertaining, or is ideal for someone unwell to use to summon assistance. Size-3 3/8 inches high by 2 3/8 inches diameter. 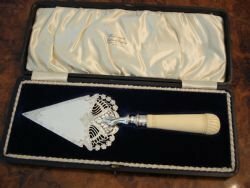 A wonderful piece to own or to give as a gift, and a great piece for the collector of silver, by a very sought after and renowned maker. 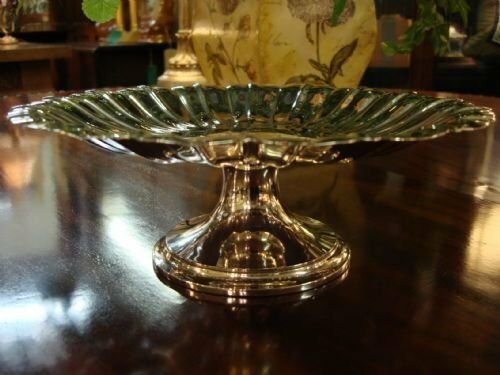 C1940, American sterling solid silver lovely fluted comport on pedestal base, by Richard Dimes Co. of South Boston, Massachusetts. This company was founded in 1908. He originally started the holloware room of the Towle Company, and eventually started his own business. Weighing 435 grams, this is a substantial and unusual piece, suitable for dessert, cake, fruit, and cheese. 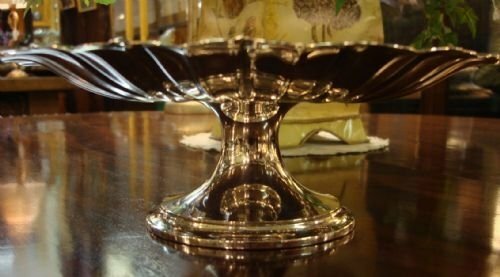 Considering the value of just the scrap weight of this comport, this is a wonderful value, as silver prices continue to soar. 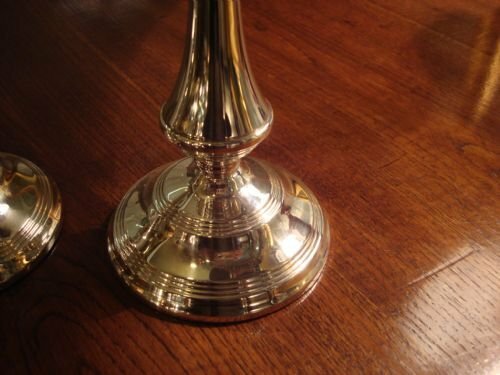 The beautifully fluted top is 9.5 inches in diameter, and rests on a stepped and flared base. It stands 3.5 inches high. 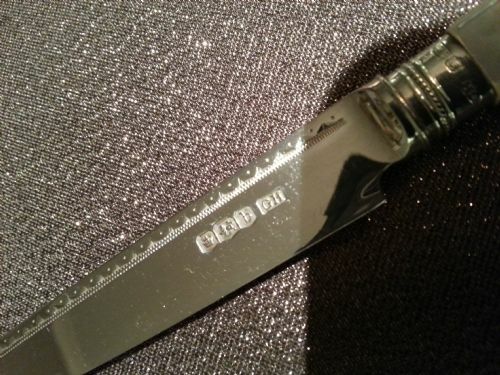 This sterling fineness is .925 fine, identical to the silver content of English sterling silver. 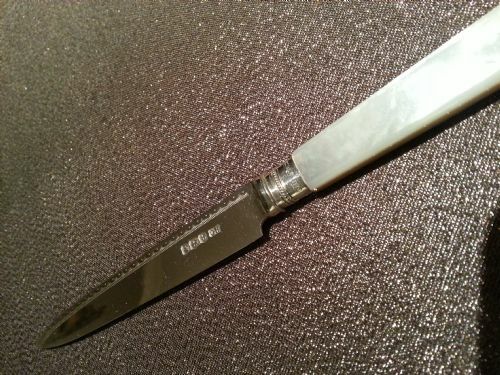 Engraved with the date 1940 underneath on the inside of the pedestal, and also with the model number 186. 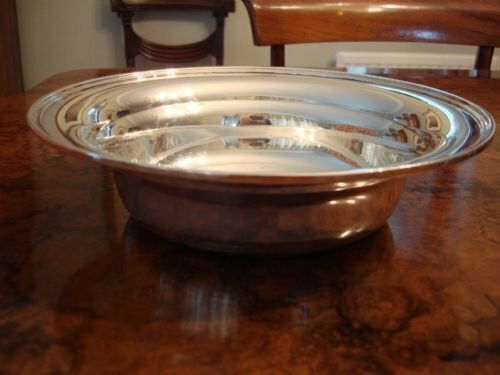 In very good condition, with just the usual centre surface scratching from serving pieces, this would grace any dinner table or sideboard, and is an excellent investment, given the soaring price of solid silver and the heavy weight of this piece. 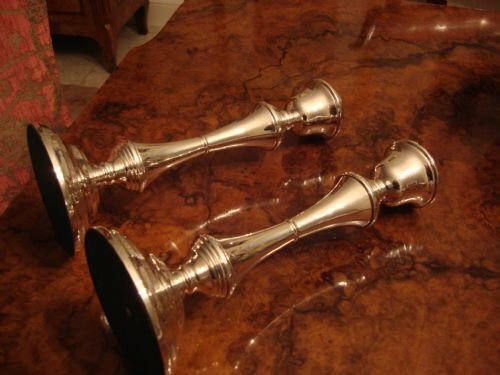 Lovely tall solid silver pair of candlesticks. Very nice tall pair of English hallmarked solid silver candle sticks, well crafted in a waisted column style with reeded design to top and base. The weighted base is covered with baize to protect the table top. 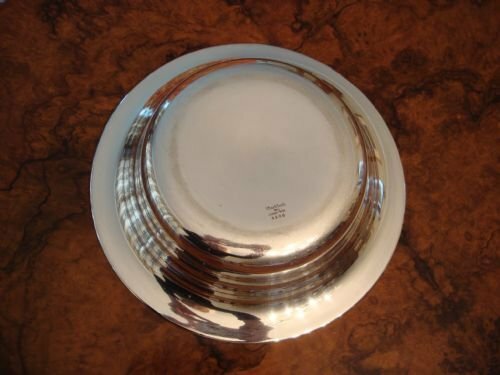 Made by W I Broadway and Co. and hallmarked for Birmingham 1972. The style would blend equally well with antique or modern decor. Size-10.25 inches tall by 4 inches diameter. Weight-approximately 1100 grams for shipping. 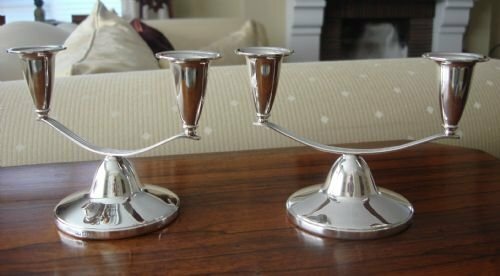 An elegant and well made pair of candle sticks in very good condition to own or to give as a gift. 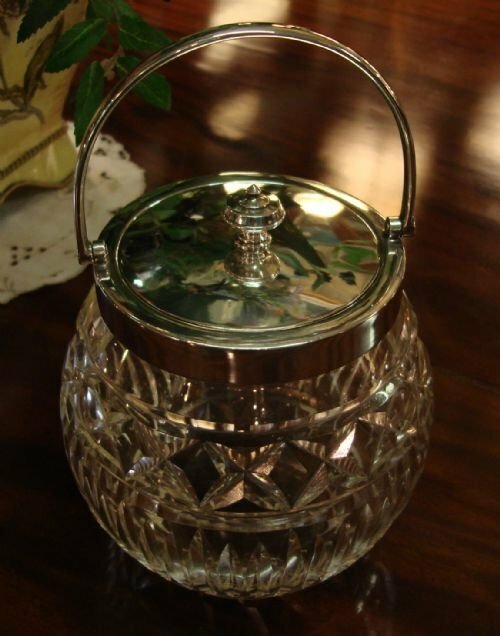 Lovely hallmarked sterling silver and cut glass biscuit box or barrel made by famous makers James Dixon and Sons. 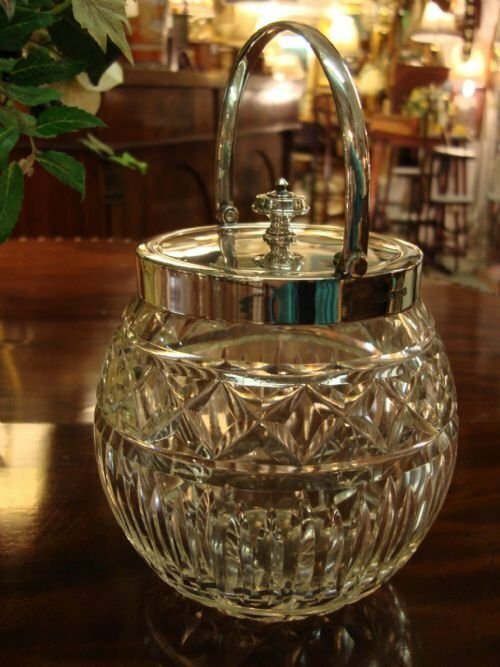 Very pretty Sheffield 1934 English hallmarked solid silver and cut glass swing handled biscuit box or barrel by famous makers James Dixon and Sons. 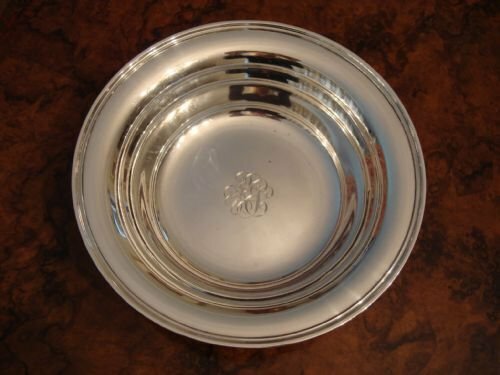 The hallmarks are clear and also include the special mark commemorating the silver jubilee of George V and Queen Mary. It is unusual to find such items with solid silver mounts, as biscuit barrels are most often found in silver plate, many at higher prices than this sterling silver one! This example has heavy gauged generous mounts with a pull off lid with impressive finial and wide band with swing handle. 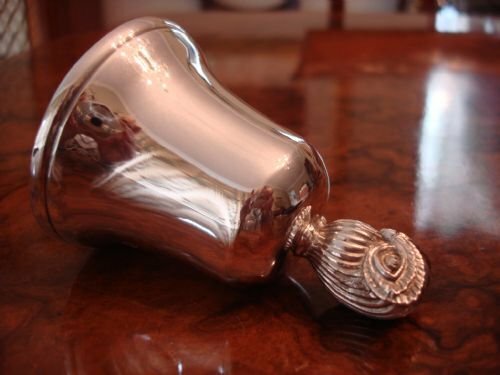 All silver parts are properly hallmarked including the nut holding the finial to the lid. The cut glass barrel is beautifully cut with a combination of bands of leafy slices and diamonds, which catch the light perfectly. 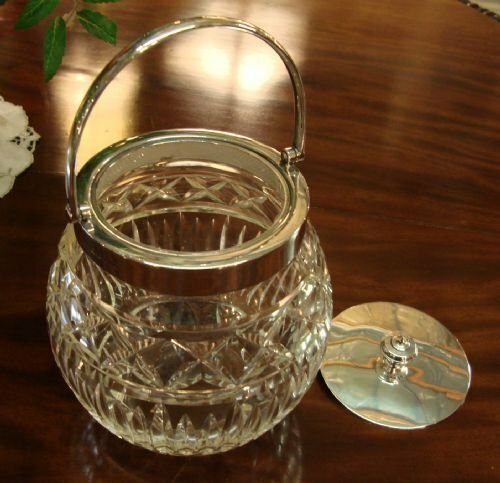 Size-8.5 inches high to top of handle or 5.5 inches high without handle by 5.5 inches wide. 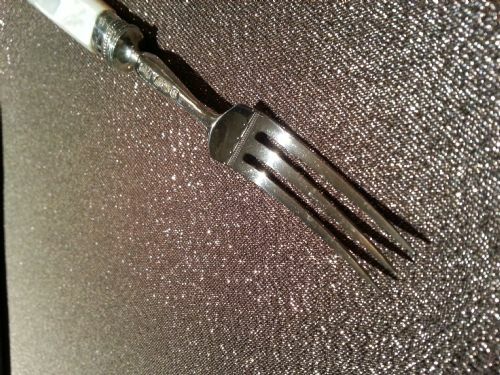 With two little flea bites to the glass and one tiny mark to the silver band, it is in very good condition overall. 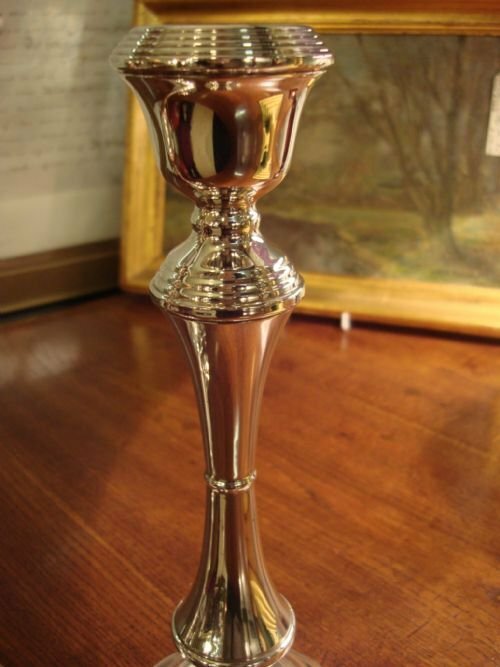 A lovely heavy piece in seldom found solid silver and cut glass, made by well known makers. 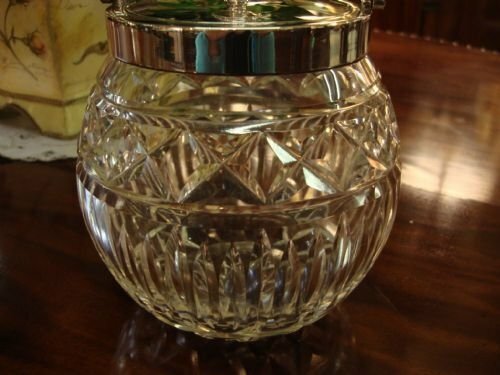 It is very useful for biscuits, dressing table or vanity items, and is a really wonderful value of its kind. 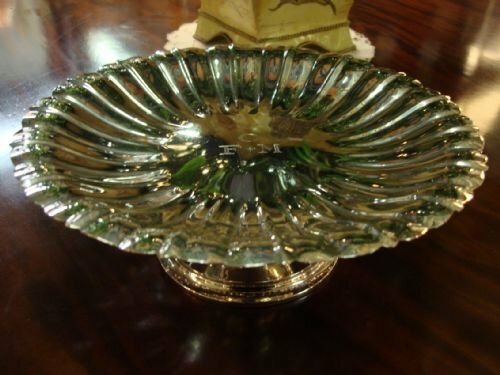 An imposing piece for the table, which would also make a wonderful gift. 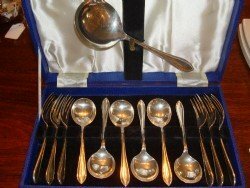 Sheffield hallmarked solid silver 13 piece dessert or fruit service canteen by well known maker Emile Viner, presented in the original case. Sheffield 1938 English hallmarked solid silver 13 piece canteen of dessert or fruit spoons and forks by well known maker Emile Viner, in the original fitted case, and retailed by Viner's as well, with some pieces later hallmarked. 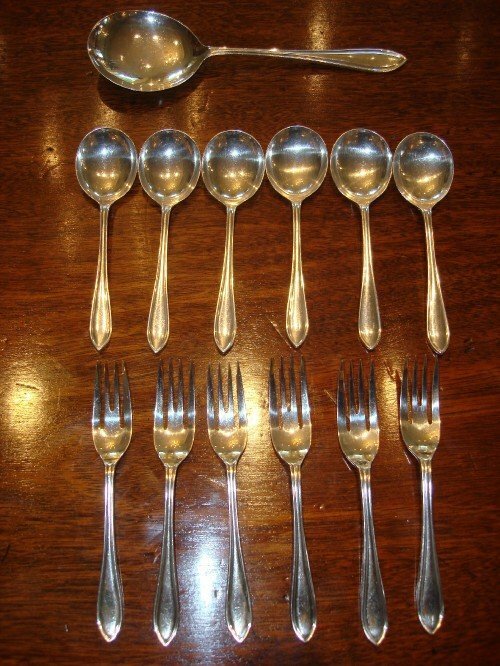 Comprises 6 dessert forks, 6 dessert spoons, and a serving spoon. The stems have a threaded edge with a pointed end, a style very evocative of the 30's and 40's, and most popular today with contemporary interiors. Weight-a weighty 430 grams, silver only. 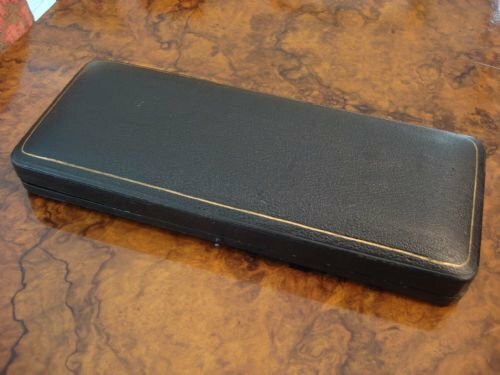 Weight with case for shipping, approximately 1 kilo. 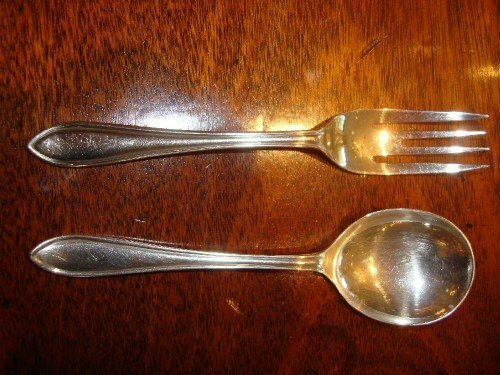 Size-forks, 5.75 inches long; spoons, 5.4 inches long by 1.5 inch wide bowls; serving spoon, 8.25 inches long by 2.5 inch wide bowl. All are in very good condition, including the original fitted case. 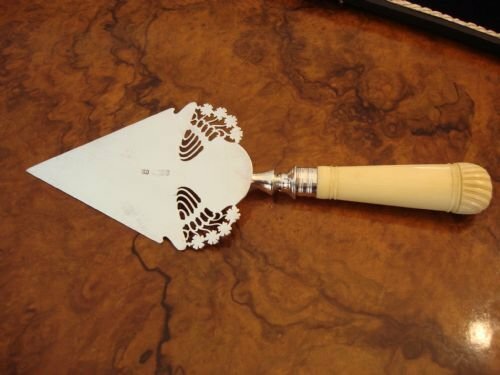 These are a wonderful value as well as a practical item to use or give as a gift. 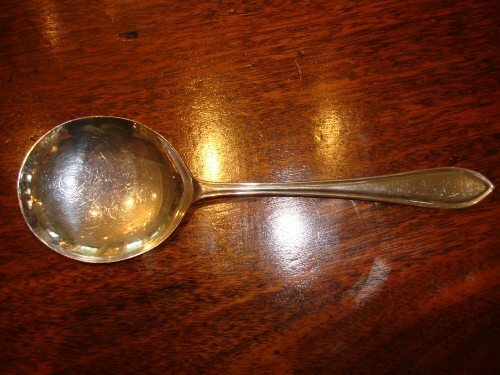 With the soaring prices of solid silver, this canteen represents an excellent investment, even just considering the weight for scrap value alone.